The cosy and spacious living room is located on the first floor. The living room with luxurious furniture has a large fire place and there is an LCD TV with satellite and a DVD player. Next to the large sideboard there is a dining table with 6 chairs. The modern open-plan kitchen is equipped with dishwasher, oven and microwave. There are 3 bedrooms and 2 bathrooms in the villa. From the living area a mezzanine brings you to the first 2 bedrooms with a luxurious bathroom (bathtub, shower). The first, double bedroom (160x200) is situated at the front of the house and has views of the sea. The second bedroom also has a double bed (160x200), as well as a bed (60x120) for a child. In both bedrooms is airconditioning, normal usage included in the rent. The downstairs apartment has a independent entrance and consists of a bedroom with double bed (160x200) and a luxury bathroom (shower and W.C). Sliding doors from the living room open onto the large, sunny terrace, which stretches along the complete length of the house, and has fantastic sea views.Here you will find a luxurious teak dining table with 6 chairs. There are plenty of lovely places to enjoy outdoor dining. The terrace is partly covered with a pergola. Here you can find the Weber BBQ and a dining table with eight seats. The Electric brise-soleil by the lounge set offers shade if desired. The terrace leads to the 36m² swimming pool situated next to the house, with a fence around it for child safety. There are luxury sun loungers and an outdoor shower. The pool can be heated at an additional cost per week. Please check the conditions. To create a nice atmosphere the pool also can be lit up at night. There is enough room for two cars to park. This villa is situated on a hill in Les Issambres. It is a 5minute drive down to the coast, the beach and the village of San Peire, located between St.Maxime and Frejus. 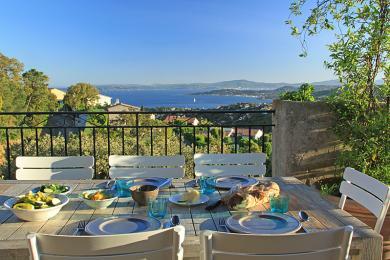 San Peire is about an hour’s drive from Nice airport and Cannes. St.Maxime is a 15 min drive away, Frejus is 30 min away and St.Tropez is a 45 min drive, although in the Summer you can take a direct boat from San Peire harbour. Les Issambres, San Peire and Ste Maxime are famous for their beautiful, long sandy beaches. The Cote d’Azur is also famous for the many beautiful golf courses which are to be found here, including the Roquebrune golf course which is just 15 minutes away. Other nearby courses include L’Endriole in Le Muy, St.Maxime, Valescure, Esterel and Mandelieu. You can play tennis with a view of the sea in Les Issambres. There is also an abundance of great restaurants on the Cote d’Azur. Try the lovely terrace at Le Provencal/Les Muriers in San Peire, or the brasserie. In Cap Mail you can enjoy great seafood whilst almost being on the beach. Children of all age are welcome in the villa. Below you can find additional information for families with children who go on holiday. There are kids toys available, several DVD’s and for the older children there is a ping pong table. Pool: Private Pool size: 9 x 4 m.
Pool water treatment: Traditional pool chlorination Depth pool: 0.60 - 1.90 m.
Pool outdoor shower: Unknown Distance from villa to pool: 5 m.